We have already reviewed Polk Audio loudspeakers here on TNT-Audio (namely: RT2000i, RT600i, RT15i), always with good results. The RTi series was aimed to a vast audience, from HT nuts to generic Music Lovers. With the newest LSi series the guys at Polk Audio aim to conquer even the most sensitive audiophile's ears. Now with new drivers, sturdier cabinets, hi-quality passive components, accurate crossovers and all the care needed to build a fine package in order to suit audiophiles' tastes...Polk Audio moves upscale. The LSi7 model under test is the smaller of this new range. It is indeed what audiophiles call a "minimonitor", a very compact bookshelf (standmounting) loudspeaker, being just 36 x 22 x 26 cm (W x H x D). It comes equipped with a small 13 cm (5-1/4") woofer and a new Ring Radiator tweeter which is shared by the rest of the LSi range (a Vifa XT 25, actually). These shielded drivers feature the usual Polk Audio proprietary Dynamic Balance technology and are mounted in a solid cabinet with a rear firing Power Port and a front firing ARC port (please refer to the official site for technical details). The cabinet is piano lacquered with real wood side panels (ebony and cherry finishes available). The whole structure appears rock-solid, free from vibrations and extremely well built. Two pairs of gold plated good quality binding posts are available for biwiring or biamping. The plate that covers the Power Port can be used as wall bracket and two big soft bumpers make on-wall installation quite easy and hassle-free (for surround applications, of course). These speakers come with a 5 years warranty on parts and labour and their suggested medium retail price is around 800 $ per pair. As usual, prices outside the USA could vary. Crossover points: 2.4kHz; HPF 18dB/oct, LPF 12dB/oct. These speakers have been tested both alone AND against similarly sized competitors during a 4 months period at home. Three different types of amplification have been used (Naim integrated amp, Naim pre + power amps, Holfi integrated amp). I'm not a big fan of minimonitors. Even for small rooms I tend to prefer small floorstanders to tiny boxes. Anyway, since recently I've been mostly using my B system (and room) I've decided to test several compact loudspeakers. You may have read my recent reviews of the Aliante CNM Compact, Indiana Line Arbour 5.30 and 5.40 and the Triangle Titus 202. In the meanwhile a new pair of the recently issued Diapason Prelude III is breaking in at home. These speakers belong to different price ranges, though they all share the same size (more or less). The possibility to test 4 compact loudspeakers at the same time gave me the opportunity to understand what the market has to offer in different price ranges. Pricewise, the Polk Audio LSi7 falls somewhere in between the less expensive Aliante CNM Compact and the exotic Diapason Prelude III. As said, I'm no fan of minimonitors. More precisely I hate having to deal with speakers stands and limited bass response. The LSi7 makes no exception to this. A good (more on this later) speaker stand is compulsory to get a decent sound and, no matter how expensive is this stand, the bass frequency response has severe limitations. Claimed tech specs state the LSi7 can reach 53 Hz @ -3dB. By ear, this datum seems a bit optimistic. Actually, the Arbour 5.30, which claims just 46 Hz at -3dB, offers a subjectively deeper bass frequency response, hard to justify by the negligible 7 Hz algebrical difference alone. That said, the bass performance of the LSi7 is honest, in the sense that quality has been preferred to quantity. No real deep bass to speak of, the overall performance can be still judged good from a qualitative point of view. Bass notes are articulated and fast, no tendency to "overshoot", no trace of boominess. The Power Port helps keeping air flow turbulence at minimum levels. The usual air "noise" that can be heard from conventional reflex ports when playing really deep bass notes is greatly reduced here. This also helps to improve that feeling of "clean" and "tight" bass notes I've already remarked. If you wish to summarize the bass performance of this speaker...you'd say dry. So it shouldn't come as a surprise that Polk suggests using a subwoofer for Home Theater (or large rooms) applications. The real "gift" the LSi7 offers to the listener is its mid-high range: clean, open and precise as it should be, considering the 800$ price tag. More precisely, the performance in this zone of the audio spectrum is WAY better the one of the less expensive compact loudspeakers cited above. Voices appear crystal clear - though a bit "light" - and natural, like on much more expensive loudspeakers. A head to head comparison with the exotic Diapason Prelude III gave a little advantage to the latter, in terms of precision and transparency, but the LSi7 is quite close. Electric guitars and accordion on Lloyd Cole's "Don't get weird on me, babe" [Polydor - 511093-2 - 1991] sound just like live instruments, with plenty of harmonics and a decidedly natural timbre. The new weirdly shaped tweeter seems the real responsible for this so convincing performance. 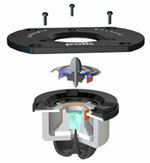 In fact, it is the very same tweeter used even in the top_of_the_line LSi 25 loudspeaker. Clearly, the accurate crossover network and the resonance-free cabinet play their key role: the two drivers can express their real sound without add-ons from cheap caps and/or micro-resonant panels. I'm referring not only to absolute sound pressure but also to overall dynamics. Though the LSi7 seems to prefer jazz and light rock, it can play aggressive heavy Music provided the amp supports it. Deep bass and heavy metal fans need not to apply here, better to look elsewhere. The new ring-shaped tweeter helps in the microdynamics department, where it really shines. It succeeds retrieving hidden musical details with ease. A small box, solidly built, equipped with hi-quality drivers...what would you expect? A realistic soundstage! You bet! This LSi7 builds a large stereophonic picture inside your listening room. It is very hard to detect the sound coming from the drivers. Actually, it is the space behind the speakers to be filled with sound. Precise imaging, excellent focus and multiple horizontal planes stage are just some of the evident qualities of this speaker. The depth of the stage - I'm sure - could be improved with more weight and depth in the bass range. This may sound weird but - sometimes - loudspeakers with deep and hefty bass have been reported as having a deeper soundstage. You may try to experiment on your own by placing a GOOD subwoofer behind the speakers. Trials and errors techniques will allow you to find the sweet spot and a better, bigger soundstage. This partially contraddicts those who swear ambiental information is hidden in high frequencies only. I believe every frequency of the audio spectrum can (and should) add reality to the holographical image created by any loudspeaker. This doesn't mean the LSi7 delivers a two dimensional sound. No, I'm just saying that the depth of the image isn't its forte. Stability and sharp focus of the contours are its best atouts. At 800$/Euro pair I can't say this small monitor is inexpensive. Yes, it is less expensive than many hi-zoot super-duper monitors...but, still, it does not belong to what I call budget-class. This means one should expect mucho quality from this product. Actually, the level of finish and craftsmanship is outstanding, this LSi7 is a small jewel. Bomb-proof, shiny like a diamond, everything seems to fit in the right place. From this point of view, I don't have serious complaints. On the other hand, the binding posts are a bit too near each other to suit my taste and the jumpers used could be improved via short pieces of good quality wires. There are no holes where to install spikes. Stand interface is possible via 4 small adhesive rubber pads only. The piano lacquer finish is NICE but painful to keep clean. Fingerprints and dust become extremely visible. Just minor complaints. The bass, considering price tag, competitors and size of the cabinet, could have been better. One may ask for more oomph, weight, impact and depth. I expect a similar performance from smaller speakers equipped with 10 cm woofers. If memory serves me well, the smaller Diapason Micra perfomed better in the bass. Furthermore, the loudspeaker needs POWER. The more the better. It is not just a matter of its mid-low efficiency (88 dB). You may have noticed speakers' efficiency has increased in the last two decades by a 2-3 dB amount (and this is a hell of an improvement). 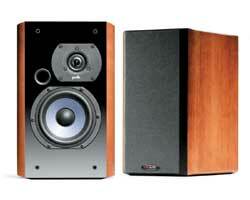 It is not rare to find similarly priced/sized speakers that offer 91/92 dB of efficiency. This means you can use half the power needed to drive the LSi7 and you can hence concentrate your budget on quality. As said, it is not just a matter of efficiency. Perhaps the load offered to the amp isn't an easy one (possible, considering the 12 dB/oct and 18 dB/oct filter slopes) but this speaker won't sing as it should when connected to budget integrated amplifiers. Finally, the 4 Ohms nominal impedance doesn't help. In my opinion, this will considerably limit its compatibility with existing mid-priced HiFi set-ups. If in doubt, I suggest you to test listen the LSi7 together with YOUR amp, at least. Use stands. Forget bookshelves. Use high quality stands, then. I've found the LSi7 performs better with expensive (and heavy) metallic stands. I used the steel columns from Diapason. I haven't tested the speakers stands suggested by Polk Audio, so I can't comment on this. Leave the speakers quite far from near walls, if you want to get a good soundstage. Placing the LSi7 near the rear wall will add a bit of weight in the bass. Try different positions and decide which one suits better your taste. As said, do not try to save money on amps. Quantity (power output), driveability and quality are mandatory. I wouldn't suggest anything below 40/50 (good) watts per channel. Of course, your mileage may vary depending on your listening habits and room size. The Polk Audio LSi7 is an attempt to give audiophile sound to customers with small listening rooms. The result is a loudspeaker better suited for jazz and light classical Music. The limited bass response and impact make the speaker less ideal for rock or large orchestral Music. Summarizing, this is a loudspeaker for mature audiophiles, those who can distinguish quality and prefer it to "quantity".